This entry was posted on Thursday, January 12th, 2012 at 16:45 and is filed under Budget, Congress, News, Politics, Ron Paul. I believe Ron Paul does this on a regular basis. When it is returned, Where does it go?? To the general fund ?? And who controls where it goes? Mark, your last line pissed me off. Just seeing the name Barack Obama and the word trillion in the same sentence does that to me. Sorry, I can't avoid telling you the truth Tracy. For the record, it makes me pretty angry too. A half-million? That ought to fund a day or two of much needed vacation fun for the first family. 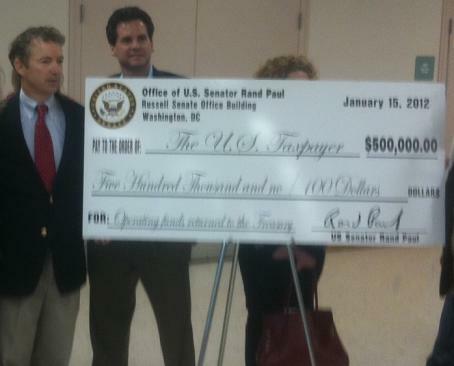 Rand Paul would be an excellent V.P. pick for any of the GOP candidates running. Perhaps we'll get a Paul/Paul ticket.